Use white face paint and black eyeliner to make a simple skeleton costume. Many commercial face paints contain chemicals you don’t want, such as perfumes, parabens, heavy metals, or allergens. They are also expensive for what you get. Here is a simple recipe for a homemade white face paint you can make that uses natural, non-toxic ingredients. You only need a few common kitchen ingredients to make your own white face paint. Stir the cornstarch and flour together. Use a fork or pastry blender to work in the shortening. Slowly add the glycerin to produce a creamy mixture. 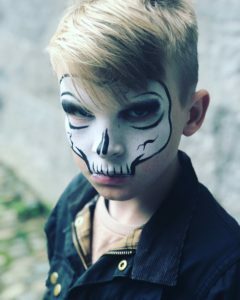 You can use this white face paint as it is or you can mix in a few drops of soft drink powder or food coloring to add color. Be aware, adding coloring may result in a product which could stain your skin. Apply the face paint with a paintbrush or makeup sponge, taking care to avoid getting it in the eyes. Removal: Use a tissue or makeup wipe to remove most of the paint. Then wash the face with warm soap and water. If white face paint is too tame for you, kick it up a notch by making it glow in the dark. One option is to mix in glow powder in place of some of the flour or corn starch.